Brrr... Snow has come early to some parts of the US. 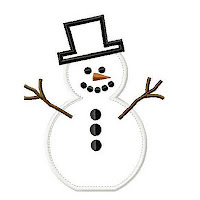 How much fun do children have building a snowman! I've named this design after the song about a snowman who comes to life by the placement of a magical hat found by some children, with whom he shares playful adventures before he has to "hurry on his way" (before he melts). At the end of their adventures together, the children are saddened by Frosty leaving, however, he reassures them by exclaiming, "I'll be back again some day." 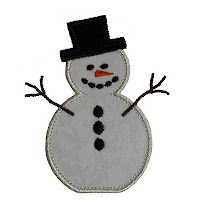 In keeping with tradition, this snowman wears only his magical hat. The design features a triple-bean inner edge stitch lining his body and his hat to add interest and bring light to the stitching. His branch arms and twig hands are very nature-like as is his carrot nose. Frosty comes to you in 3 sizes - 4", 5" and 6"
4x4 hoop - exact size 3.93" x 3.11"
5x7 hoop - exact sizes 4.99" x 3.97" and 5.96" x 4.78"
Your files include easy to follow Step-by-Step instructions.